Program Specific miles: These are miles that you would earn from a credit card that is associated with a specific airline or hotel, also known as a co-branded credit card. For example, the Chase United Mileage Plus credit card only earns United miles. You must redeem these miles through United, although you are able to book flights on other Star Alliance airlines (a great feature!). With these types of cards the miles live in your frequent flyer account and if you decide to close the credit card before paying the annual fee you won’t lose your miles. Bank Specific miles: These are miles that are issued directly by the bank. These points live within your credit card account and can often be transferred to a variety of frequent flyer and hotel programs. You also typically have the option of redeeming these miles for travel booked through the credit card’s travel portal. The three main types of bank miles are Chase Ultimate Rewards, American Express Membership Rewards, and Citi ThankYou Points. Of these three, I value Chase Ultimate Rewards the most given their great transfer partners and ability to redeem easily for hotels and flights. An important note about these types of miles is that if you close your card you will lose any miles still in the account – so always be sure to use them or transfer them before cancelling! Fixed-value miles: Fixed-value credit cards earn “miles” that are redeemable for any travel expense that you use your credit card for. They typically operate with a value of 1 cent per mile and provide arguably the easiest redemption options. For example, you could book a $1,000 flight to Geneva using a fixed value card and then redeem 100,000 miles to cover the expense (although as you’ll see we can get a much better value out of the first two types of cards). I find that fixed-value cards are best for staying in Airbnbs, hostels and other types of travel that aren’t bookable using traditional hotel and airline miles. As is the case with most international trips, your flight is going to make up a huge portion of your budget. International flights from the US to Geneva can run well over $1,000 in the peak summer season which can quickly bust your travel budget. Using the travel hacking strategies described here we were able to fly round-trip from Denver, Colorado to Geneva, with a four-day stop in London on the way home for less than $200 per person. We booked our flights using United Mileage Plus miles that we had accrued from opening just two credit cards – the Chase United Mileage Plus card and the Chase Sapphire Preferred. Here is how we went about it. We each concurrently opened the United Mileage Plus credit card and put all of our respective spending on it. After 3 months we had each met the requirements and earned the bonus points. At this point, we simply set that card aside and opened up the Chase Sapphire Preferred card. We followed the exact same steps, putting all of our normal spending on the card until we had met the minimum spending requirements and received the bonus miles. After 6 months we each had 40,000 United miles and 50,000 Chase miles, more than enough to book our international flights as well as a hotel for the start and finish of the TMB. Read on to learn how to go about actually booking your flights. When booking flights from the US to Europe on United Airlines we have to look at the United Award Chart to know how many miles we will need to redeem. You can find the United Award Chart here. The chart is organized with your departure region on the y-axis and your destination region on the x-axis. Simply locate where you are leaving from (in our case the mainland US) and follow that row until you find the Europe column. That box will tell you how many miles you’ll need for a one-way award ticket. Locate your departure and arrival region to determine how many miles you’ll need for a free flight. United Mileage Plus credit card: Current bonus of 40,000 United miles after spending $2,000 in 3 months. The $95 annual fee is not waived. Chase Sapphire Preferred: Current bonus of 50,000 Chase Ultimate Reward points after spending $4,000 in 3 months. The $95 annual fee is waived for the first year. The Chase Sapphire Preferred is ideal for our purposes since the points earned are transferable to United (and many other great programs). Once you have opened these two cards and met the minimum spending requirements you will be ready to book your (nearly) free flight to Geneva! The process is simple: just be sure you have 60,000 United miles in your MileagePlus account from a combination of the United miles you earned and any remaining that you need to transfer to United from your Chase account. Next, simply head over to United.com and enter your flight information and select the checkbox that says “Search for award travel”. The next screen that appears will show you award availability for the dates you’ve selected. We are looking for dates that have the solid blue line, which indicated that there is a Saver level ticket available. When looking at award availability for next summer I found a ton of seats from our home airport in Denver, CO to Geneva. Lots of award space from Denver to Geneva for next summer! When you select a specific date, United’s website will bring up all of the flight options for that day. 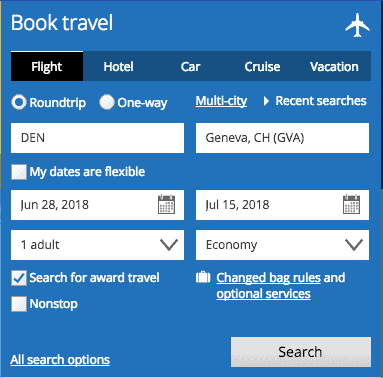 Looking at June 27th I was able to find a flight from Denver to Geneva for 30,000 miles plus $42.50 in taxes and fees (this is what I mean by nearly free). Denver to Geneva for just 30,000 miles and $42 in taxes and fees! On the way home I was able to find a flight from Geneva to Denver for 30,000 miles plus $83.96 in taxes and fees. So for a total of 60,000 United miles and $108 in taxes and fees you’ll be able to fly round trip from Denver to Geneva, Switzerland. Amazing! Geneva to Denver also has tons of award availability for next summer! Looking at specific dates I was able to find a flight from Geneva to Denver for 30,000 miles and $84 in taxes and fees! Now if you’re like us and camping on the TMB, you won’t have much in the way of needs for hotel rooms. However, we found that staying in a hotel the night before we started as well as the night we finished was a great way to get organized and relax after walking for over 100 miles. If you’ve opened the two cards mentioned above, you should have somewhere around 30,000 Chase miles remaining from your Chase Sapphire Preferred sign-up bonus. One of the great features of this card is the ability to book travel through Chase’s website and get 1.25 cents per point for any flight or hotel that is searchable. I’ve found that Chase’s portal has a good selection of hotels that are all competitively priced. So, if you want to get two free hotel nights for the start and end of your trip, all you’ll need to do in login to your Chase account and and find a hotel that will meet your needs. Given that you will get 1.25 cents per mile, you’ll have approximately $375 to book two nights in Chamonix! You will have tons of options and should be able to find a great hotel for both nights. We stayed at the Hotel Le Mogane and enjoyed it, but there are lots of different hotels in Chamonix or Les Houches to meet any need. You’ve now booked your flight from the US and two nights in hotel for nearly free, just from opening two credit cards. This deal gets even better if you have a travel partner who does the same because you’ll double the number of Chase miles that you have remaining, letting you book even more free travel! So there you have it. The information above walks you through how we used the incredible world of collecting miles and points through credit card bonuses to save over $1,500 each on our TMB trip. If you are camping the rest of the way your expenses will be incredibly low, and you can easily complete the entire trip for less than $500 per person. Not quite free, but a deal that I would take any day! Be sure to subscribe below to get more posts on how we travel all over the world for (nearly) free sent directly to your inbox!